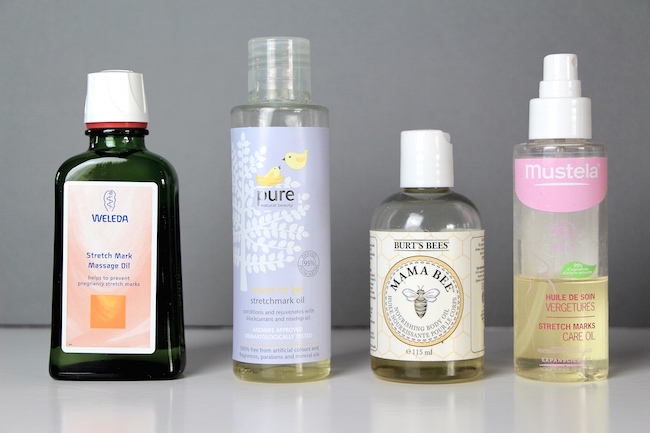 M&S Pure Mum to Be StretchMark Oil: where has this gone? It says discontinued! A great shame if it has been – this was a very simple oil with a gorgeous texture and it really left my skin feeling supple and soft. Why do they always get rid of the good stuff? Burt’s Bees Mama Bee Nourishing Body Oil: £11 or £9.99 with free delivery at Amazon. I really loved this one – a sumptuous oil that you could really massage in for ages (I got carried away most nights with my oiling, spending about ten minutes at a time!) but with a fresh, citrus scent. From the lemon oil, I suppose. The pourer was good on this one – lots of oils had stupid stoppers that didn’t dispense enough at a time, and others just had wide open necks that poured out half the contents. This one was just perfect. Highly recommended. Mustela Stretch Marks Care Oil – you can read the full review on this one here. It left my skin very, very soft and silky indeed. Impressive. Unscented and unfussy, great for those who want to keep things simple. A note on stretch marks and stretch mark prevention: people seem to be quite divided on whether stretch marks are genetic and if oils and treatments can help. Personally, I wasn’t ever prepared to risk it. It’s not as though massaging on some oil every night is that much of an effort – I actually find it to be very enjoyable and relaxing! My Mum had no stretch marks, but she oiled herself daily (always has done, still does) and swears that’s why her skin is so good and supple. For me, even if there was no chance in the world I would ever get stretch marks, or indeed, even if whatever I did was going to be of no use at all against the hand of genetic fate – I would use some kind of body oil after bathing or showering. It’s a lovely habit to get into. And another sidenote: my sister didn’t get any stretch marks at all on her tummy, back or legs. All of the places she oiled regularly. She didn’t however, oil around her bust. Can you guess where she had stretch marks appear? Coincidence? I’m tempted to think not.